I grew up hearing that children should be instilled with good core values so, ideally, they’ll cling to those good values and not grow up to be jerks. And that is why I’m going to do my part to instill good values in my new niece, Emma. Not long after my sister told me that she was going to have a baby I decided to help this new, little person to become a good person. Armed with a plan, I took action—and made her a baby-size Helga horn hat. 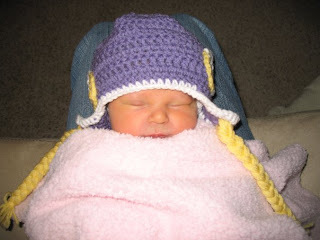 She may not know it yet, but Emma’s going to become a Vikings fan. Some things are too important to be left to chance. Emma may have ample opportunity to be led astray and wooed by other NFL teams, but I’m going to do my best to keep that from happening. And there is a whiff of destiny to this because of all years to become a Vikings fan, this is one of the best ones since 2002, the last Vikings’ appearance in an NFC championship game. Being born in a year when the Vikings were the NFL sack leaders, were the second-ranked run defense, and when Brett Favre threw a career-low of seven interceptions has to be a good sign. If ever there was a good year to become a Vikings fan, this is it. Even before the hoopla surrounding Brett Farve’s ousting from Green Bay, the Vikings were an ascending team. Team owners, Zygi and Mark Wilf, wanted to build a team to win championships and they have been willing to shake things up and lay out the cash to make it happen. In the four years the Wilfs have owned the team the Vikings have drastically changed personnel throughout the entire organization. A dome team, they built the Vikings for speed, an old-fashioned running game, and tough defense. They drafted the best players available regardless of position and signed free agents strategically. And this seems to have been a successful combination because this year the Vikings have ten players named to the Pro Bowl. Ten. The last time the Vikings had ten players named to the Pro Bowl was 1998. And then, on August 18, 2009, the Minnesota Vikings signed long-time Green Bay Packers quarterback Brett Favre. Adding Favre to the team would have made the 2009 season one to watch even if the rest of the team was mediocre at best. But the Vikings were a good team whose only glaring deficit was at the quarterback position. In August the strength of Brett Favre’s surgically repaired arm was unknown, but it’s January now and it seems safe to say that his arm is looking pretty darn good. Which is handy because he’s had to gun the ball downfield a lot more than he thought he would back when he signed with the Vikings. This year has been a great year for Vikings football and a great year for stories about Vikings football. Back in August I speculated that there had to be at least a couple executives at Disney watching how Favre’s year would unfold because his 40-year-old season has “inspirational sports movie” written all over it. However, he’s hardly the only story, just the most obvious one. Several players have had a fantastic season, which is something of an understatement considering that half the NFC Pro Bowl team will be sporting purple helmets. Probably my favorite development to watch this season has been the breakout performance of Sidney Rice. Considered a draft dud last year, now in his third year with the Vikings Sidney Rice is one of Favre’s favorite deep targets, hauling in three touchdowns during the Vikings victory over the Dallas Cowboys. And, I know it is a petty thing, but I’ve been comparing Rice to Randy Moss for a long time and it’s a little annoying to see the rest of the sports media world jumping on that bandwagon now. Yup, if ever there was a good year to become a Vikings fan, this is it. And in a few years when I’m taking Emma to her first Vikings game, I’ll remind her that she became a fan in a very good year.